HIIT workouts are an incredibly effective way to torch calories without spending hours on the treadmill. But if you’re new to HIIT workouts, it’s important that you start with HIIT workouts for beginners. If you commence your HIIT training with a workout that’s too advanced, you run the risk of injuring or illness. And despite the many benefits of HIIT workouts, if you don’t start off a pace appropriate for your current fitness levels, the negative side effects will outweigh any of the positive benefits. 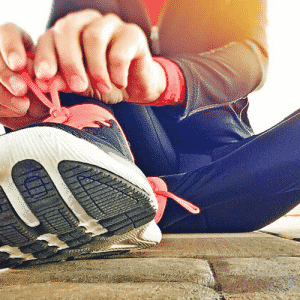 Make sure you warm up before performing any HIIT workout, focusing specifically on activating the muscles that you’re going to be working during your HIIT routine. Listen to your body – there’s good pain and there’s bad pain when it comes to working out. Feeling a burn in your muscles because you’re exerting yourself at an appropriate pace is “good pain.” You’ll usually keep feeling this type of muscle soreness after your workout – this is called “delayed onset muscle soreness” and it’s a sign that you’ve challenged your muscles and that they’re repairing, rebuilding and becoming stronger. With that being said, here are 4 fast HIIT workouts for beginners that you can easily do at home. Tabata is great because it’s high-intensity exercise that lasts for just 4 minutes but torches fat. You’ll be going at maximum intensity for 20 seconds then resting for 10 seconds, for a total of 8 cycles. Warm Up – Begin with a 5-minute warmup, lightly jogging or brisk walking. The goal here is to loosen your joints and warm up your muscles. Jumping jacks – Perform as many as you can for 20 seconds, then rest for 10 seconds. High knees – Perform as many as you can for 20 seconds, then rest for 10 seconds. Jump squats – Perform as many as you can for 20 seconds, then rest for 10 seconds. Mountain climbers – Perform as many as you can for 20 seconds, then rest for 10 seconds. For this workout, you’ll be performing each exercise for 30 seconds then resting for 10 seconds, before moving on onto the next interval. You’ll then repeat the cycle for a total of 3 times. Interval 1 – Squats – Do as many squats as you can for 30 seconds and then rest for 10 seconds. Interval 2 – Squat jumps – Do as many squat jumps as you can for 30 seconds and then rest for 10 seconds. Interval 4 – Side lunges – Now repeat with the right leg, doing as many right leg side lunges as you can for 30 seconds and then rest for 10 seconds. Interval 5 – Sumo squat with upright row – Do as many sumo squats with upright row as you can for 30 seconds. Choose the level that is appropriate to your current fitness level. You can complete this HIIT on a treadmill or outdoors – it’s up to you. However, if you choose a treadmill, for safety reasons do not sprint as fast as you can. Remember to listen to your body – push yourself but always be mindful of how you’re feeling. Warm Up – Begin with a 5-minute warmup where you’re jogging at an easy pace or walking, depending on your fitness level. Beginners – Run as fast as you can for 15 seconds, then walk for two minutes. Repeat 5 times. Intermediate – Run as fast as you can for 30 seconds, then walk for one minute. Repeat 8 times. Advanced – Run as fast as you can for 30 seconds, then walk for 30 seconds. Repeat 12 times. If you’re on a treadmill, increase the incline. If you’re outdoors, try to find a hill to run up. For this HIIT, you’ll need a medicine ball. Choose a weight appropriate to your current fitness level. 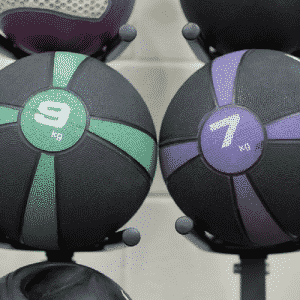 If you’re not sure which weight to choose, usually an 8lb medicine ball is a good place to start. If you find 8lbs to heavy, buy a light medicine ball and work your way up. After each interval, rest for 30 seconds by doing a light jog on the spot. Repeat the routine 3 times. Medicine Ball Toss – Toss the medicine ball into the air about a foot and catch it. Repeat as many times as you can for 30 seconds. Burpees – Squat while holding the medicine ball. Place the ball on the ground directly in front of you. Jump back with your legs into a plank position while holding the ball. Jump back into a squat, then stand up and jump holding your arms straight up while holding the ball. Repeat as many times as you can for 30 seconds. Lunges – Hold the medicine ball above your head and lunge forward with your left foot. Bring the medicine ball down towards your right foot. Place the ball back above your head and lunge with your right foot then bring the medicine ball down toward your left foot. Repeat as many times as you can for 30 seconds. Medicine Ball Push Ups – Begin in a plank position. Place the medicine ball under one of your hands and bend your elbow so that your body stays aligned. Lower your body to perform push-ups. Repeat for 30 seconds with your right hand on the medicine ball. After 30 seconds recovery period, repeat again with your left hand on the medicine ball.